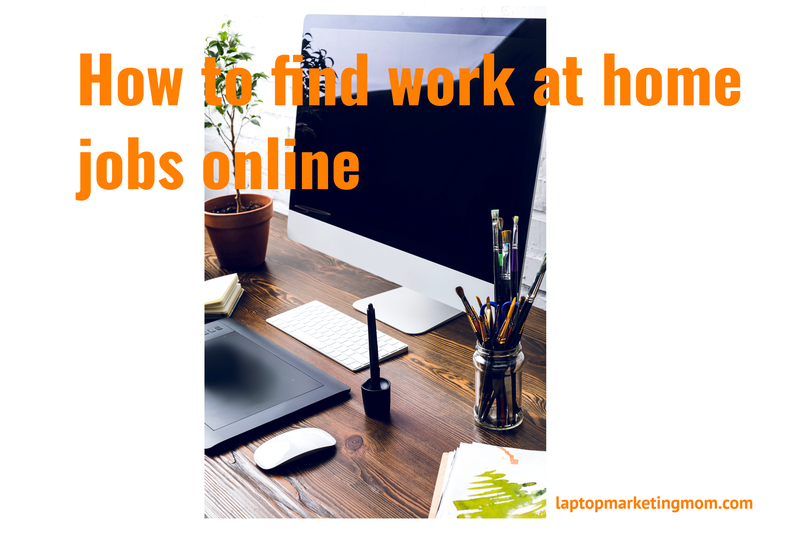 Over the years, I have looked for work at home opportunities that will allow me to work at home, which will not only allow me to spend more time with my children, but will completely eliminate my commute to work. One of the easiest ways to do this is to work at home as a customer service job agent. All you need is a PC or in some cases a laptop, a landline, headset, and a quiet work space. Anybody can work from home–if you have the discipline to do so…stay-at-home moms, college students, veterans, and retires can all work from home as customer service agents. Alorica is at the top of my list, because I have personal experience. I worked for this company out of the comfort of my own home (in most cases when my children are in bed) for over three years on a part-time basis. Alorica at home employs thousands of work-at-home agents in many states across the United States. The company hires home-based agents as employees, not contractors as some of their competitors do. Which means paid training…at your own pace, no less. Employees received inbound calls from their various clients. Client services includes online chat, technical support, customer service, and sales. Employees can expect to be paid on a per-call or per minute basis (but not less than minimum wage in your state). It is not usual for employees to make $12-$16 per hour. The best part is, employees has the opportunity to make their very own schedule in 30 minutes intervals. All you need is high speed internet, a PC, landline, and a quiet work area. Also, expect an extensive background and drug screening before a job offer. Stay tuned for my comprehensive review on Alorica…coming soon! 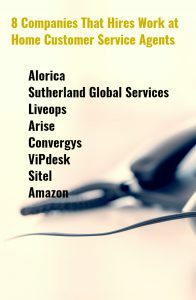 Next on my list is Sutherland Global Services (SGS), CloudSource is the work at home division. Although, my time here was brief, I can tell you that SGS is a great company to work for. Like Alorica, CloudSource hires employees not contractors, what this means is you will have the same benefits as other employees, including medical and 401k. In 2015, SGS was ranked # 3 on Flexjobs’s 100 Top Companies with remote jobs. They are always hiring for both part and full-time positions, and you can make from $8.50-$12 per hour, which is paid bi-weekly. All you need is high speed internet, a PC, landline, and a quiet work area. Liveops is another company that hires work at home agents, but as contractors. This means that as a contract, you are in charge of your own taxes and you will not eligible for employee benefits. Training is also not paid, because as a contractor you are your own boss. However, the company does charge a fee for background and credit check. You should note that as an independent contractor with Liveops, you will be paid per minute of talk time, which is not guaranteed minimum wage; however most agents can expect to make between $5.25 and $9 per 30-minute time block. Liveops hires from across the United States and for many industry, healthcare, insurance, retail, telecom, and federal government–to name few. Most calls are inbound and they have many different types of agents, including bilingual–based on the industry. As with any of the other companies on this list, you will need a dedicated phone line, PC, high-speed internet connection, a quiet work space, and a headset. 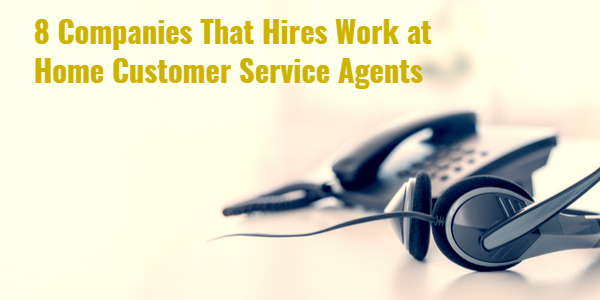 Convergys is another company that hires work at home customer service agents. Some positions are either sales or technical focused. You have the option to choose which one of these positions better suits your interest. Convergys offers paid training and opportunities for advancement in the United States, Canada, and the United Kingdom. The company does not offer a position in all States, so you will have to check their website to see if your state qualifies. The pay range can be between $7 and $12 per hour, which is paid bi-weekly in the United States. Unlike some of the companies on my list, with Convergys, you will have to set a schedule and stick with it–either part time or full time. You will need a dedicated phone line, high-speed internet connection, a PC wireless is not allowed), quiet work space, and headset. Arise is one of my favorite work at home company. Arise is a bit different from the rest of companies on this list. Arise allows stay-at-home moms, college students, veterans, and retires to start their own home-based call center business. Of course, you will need the basics, a dedicated phone line, high-speed internet connection, a PC wireless is not allowed), quiet work space, and headset…but you will also need to have your own business incorporated, with a TIN. With Arise, you can hire other contractors or employees to work for you. As you can see, this option, gives you more opportunity to make more money. You also have the option of only being an agent by signing up with another Arise business partner. Arise has several clients, which includes some big merchants that you are sure to be familiar with. To start your own business with Arise, the starting cost can be extensive or not…depending on what you consider expensive. Keep in mind that starting any other business will cost a lot more. From experience, the startup cost can run you anywhere from $250 – $770, which includes incorporating a corporation. If I remember correctly, I spent approximately $400 (this depends on the state). Training is not free, as a matter of fact, you will have to pay for all certification courses, which can be anywhere from $50 to $250. Although, I believe I took one certification course for $25 (sometimes they have discounts). I will write a comprehensive review on Arise, so stay tuned for that. ViPdesk is always hiring for work at home customer service agents also known as Brand Ambassador. 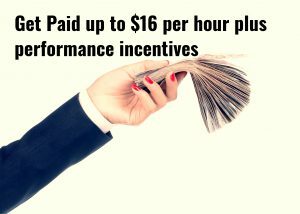 Reps can make up to $18 per hours. This is another one in which you must adhere to a set schedule, which is one of the reasons why I didn’t accept a part-time position with the company. ViPdesk hires agents to handle customer inquiries via phone, chat, and email. You will need the basics, a dedicated phone line, high-speed internet connection, a PC wireless is not allowed), quiet work space, and headset. Sitel hires customer service agents to work from home. Full-time agents are eligible for benefits. To qualify, you will need the basics, a dedicated phone line, high-speed internet connection, a PC wireless is not allowed), quiet work space, and headset. I like this company because they offer opportunities in many business sector, which includes, retail, travel, sport, and insurance, to name a few. The pay is dependent upon client and the skill set needed to complete the job. However, it has been reported that customer service representatives salary range is $9.75 to $15 an hour. Did you know this one? Yes, this giant e-commerce has many sites all over the world. Although, their work at home section is fairly small, but is still expanding. Amazon work at home team are generally customer service representatives and technical support. You will need a high-speed Internet connection and a dedicated phone line at minimum to be considered for a customer service position with the company. The pay rate of a home-based agent is approximately $10 with incentives based on performance. These positions are not offered in every state, as a matter of fact, only a select few. Agents must be able to work a flexible schedule to be considered for the positon. These 8 companies that hires work at home customer service agents are only a select few of offering work at home customer service jobs. To learn more about any of these companies and their job openings, please view their websites for information. If you have worked for any of these companies, please tell us about your experience. I had no idea there were so many choices for customer service jobs at home. very helpful for those of us who have to stay home due to kids, or transportation issues, or disability issues. Yes, as long as those kids stay quiet, you are good. Thank you for such an informative article, I will check into these straight away. It would be great to work from home. Glad to be of help, you can also search ” rel=”noopener” target=”_blank”>indeed.com or flexjobs.com for more WAH opportunities. Thanks for visting. Yes there are many companies out there that offer this work at home opportunies such as these. Yes, Arise is a great option if you want to start your very own mini-call center and hire work at home agents yourself. I too have been looking for work from home options, and I am really glad I found this post. It sounds like there are some really good opportunities out there and you did a lot of the research already. This seems like a great idea for students, or stay at home moms (if you can find time between mommy duties). Do you know what types of hours these jobs keep? It’s nice to know most of them offer part-time or full-time opportunities. Thanks for sharing, this is just what I am looking for. Some of the companies are flexible, where you get to pick your own hours, but some you have to pick a set schedule and stick with it. This also depends on if you are full or part-time. Great information on possibilities to work from home. I’ve never heard about these companies, but the idea that they can provide a flexible schedule, paid training, and some benefits, appears very attractive to many people who have to stay at home for some reasons. I will forward this info to my friend who has to stay at home to provide care for her declining parents. This is an amazing website with an amazing article, keep this work on. 1. Are your still working from home? 2. Do you recommend working from home as opposed to a commute job? Just interested in some of the cons you have on at home jobs. Yes, I am still working from home with Arise only. Working from home is not for everyone, you must be desciplined firs of all. Yes, no commuting is a big factor for me to work at home. Also, I am home when my children leaves for school and when they get home. Thanks for visiting.